They say art is about the details, and geeks say the same about Apple's products. Are Apple's gadgets and computers a new form of art then? I don't know, but sure they are an example of excellent industrial design that meets consumers' tastes and needs. So what could ever happen if art as we know it joined Apple's design as an app for the iPhone? I'm pretty sure something like The Cartographer for iPhone would happen. 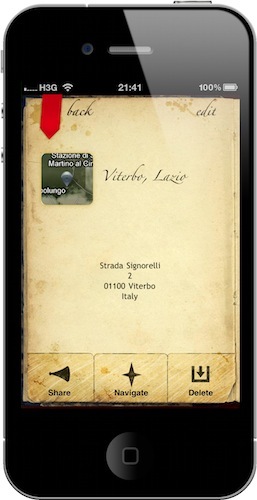 A simple app that turns Google Maps into a beautiful experience based on the maps that once were. Maps were a work of art for men -- artists -- committed to providing a detailed representation of Earth using the tools available back then: people's eyes and pencils. Maps were geographic paintings of our planet, and The Cartographer wants to bring back that old feeling and approach by combining a highly custom vintage UI with the power of Google Maps. It's not that you'll see a vintage Google Map in this app. Instead, the developers have tried to wrap Maps' satellite view (you can of course switch to other views, but the satellite is the one that doesn't break the illusion) around a wooden/paper-like custom interface for iPhone that should make you think you're seeing a vintage map on screen. The result is quite pleasant, innovative and manages to trick users to say "hey nice, that looks old". My friends did, I'm a nerd and I immediately realized that was a Google Map around some graphics -- this doesn't matter. So back to what the app does, it also connects with your Google account so you can import the maps you saved in Google's My Maps service. I had never heard of such functionality before, and it turns out it's something you can use to plan trips and such. Sweet. 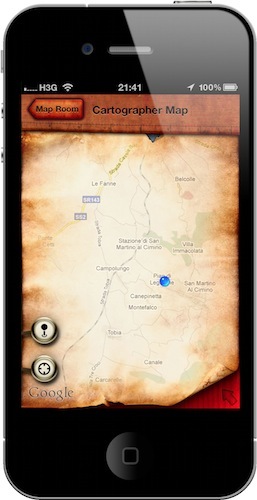 The Cartographer can pull those maps, and even show pins you placed on the map with its own vintage stuff. The main screen offers a list of all the maps you've either created on the device or pulled from Google Maps, and if you play around with the Settings you'll see another map service is supported: OpenStreetMap. OSM allows for offline caching to view maps when you're not connected to the internet. In the settings you can also set your distance unit preference and add as many Google accounts as you wish. There's only one thing I don't like about this app, and it's the weird mix of vintage graphics and iOS UI elements it displays from time to time. 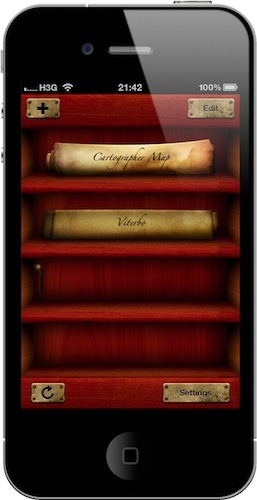 For example, iOS controls will appear on screen above the vintage UI if you try to edit maps. That's not really good looking, and I wonder if the developers will find a way to offer a better solution. If you go custom, go custom all the way. Overall, The Cartographer is a beautiful app that does something you sure haven't seen anywhere else on the iPhone. It feels new and strange sometimes, and that's exactly why you should give it a try. Available at $1.99 in the App Store.